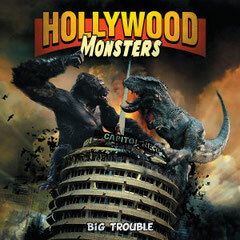 New project band HOLLYWOOD MONSTERS will release their debut album "Big Trouble" featuring Classic Hard Rock artists Paul Di'Anno, Denis Baruta, Tim Bogert, Olivier Brossard, Vinny Appice, Don Airey, Emmanuel Lamic and Laetitia Gondran through Mausoleum Records on May 23rd 2014. HOLLYWOOD MONSTERS is the brainchild of vocalist, guitarist and composer Stéphane “Steph” Honde, a French expatriate who’s been living in California since 2012. Honde first became noticed when he was fronting in Mamooth, subsequently garnering a well-deserved reputation as a guitar virtuoso when he was playing in a French rock group Café Bertrand he joined in 2004. He has toured along with the band and perfomed at humongous stadiums such as the Stade de France which has an audience capacity in excess of 80,000 with classic rock giants such as AC/DC and Deep Purple.